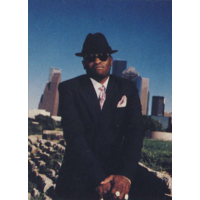 Brad Terrence Jordan (born November 9, 1970), better known by his stage name Scarface, is an American rapper and record producer, best known as a member of the Geto Boys, a hip hop group from Houston, Texas. He grew up in Houston and is originally from the city's South Acres (Crestmont Park) neighborhood. In 2012, The Source ranked him #16 on their list of the Top 50 Lyricists of All Time, while About.com ranked him #10 on its list of the 50 Greatest MCs of Our Time (1987-2007).